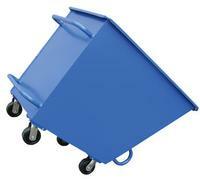 Easy to move and empty contents when dumped. 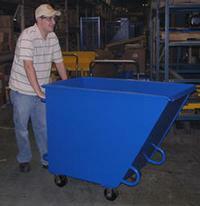 Balanced design makes dumping of scrap, chips and waste easier. Constructed of welded 14-gauge steel for strength and lighter weight. 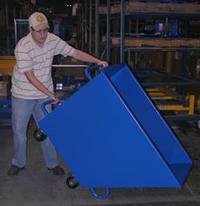 Unit rolls smoothly on (2) rigid and (2) swivel 5" x 2" poly-on-steel casters. Push handle is removable and may be used at either end. Industrial grade blue powder coat finish.